Sudanese President Omar al-Bashir will not stand in the next presidential election due in four years, a ruling party official has said. The move is part of a package of reforms aimed at democratising the country, Rabie Abdelati said. Mr Bashir, aged 67, has been in power since a coup in 1989. Mr Bashir has been indicted by the International Criminal Court for war crimes and genocide in the Darfur region. He denies the charges. Mr Abdelati, a member of Sudan's ruling National Congress Party (NCP), made comments about Mr Bashir's decision not to seek re-election during interviews with foreign news agencies in Khartoum. "I can confirm, 100%, that Bashir is not going to run for president in the next election. He will actually give a chance to different personalities to compete for the position," Mr Abdelati told the AFP news agency. "But he is not under pressure... This is not in the context of the change that is happening in the Arab world. It is happening because of the political strategy of the NCP to broaden participation," he added. Mr Bashir himself has not publicly spoken about his political future. Last week, Mr Bashir reportedly told his party that he may step down if the NCP adopted a retirement age of 60 for people holding major political posts. However, the opposition played down the move, saying it was simply an attempt by the government to head off potential mass protests - similar to those that have swept the region. 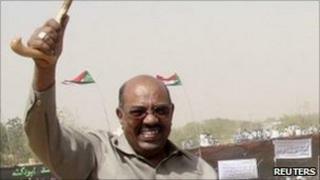 Mr Bashir won last April's presidential election, which was marred by accusations of fraud and an opposition boycott.